A family friend who’s an accomplished chef invited me to one of her favorite places to eat last week–508 Restaurant and Bar. She promised that in addition to excellent savory courses, their desserts were to be taken seriously. I took them very seriously. What differentiates really good made-to-order churros, beignets or bombolini? Since they’re fried they’re going to be pretty tasty. To me, the answer lies in the how crisp you can get the outside while making the inside almost batter-like. 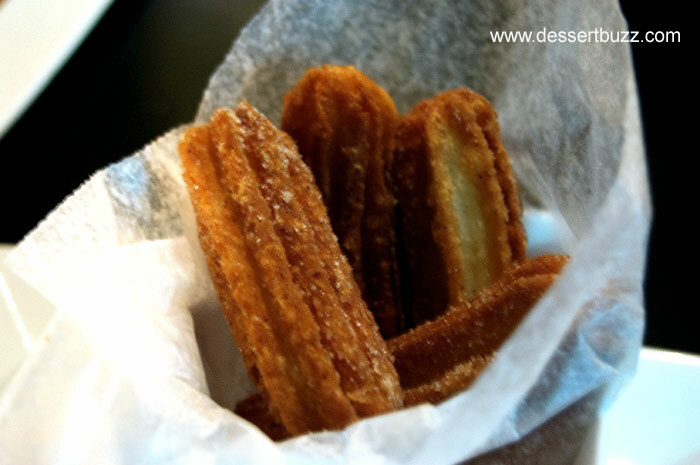 The churros from 508 were just that: ultra crispy outside, piping hot and soft inside. They were served with Valhrona dark chocolate dipping sauce. The molten chocolate cake was plated along with a chocolate-relief design from the chef, making it special and memorable. This cake was different from the standard molten cakes you see all over the place: 1) It was served with sea salt, making a sweet-salty dessert instead of just sweet. 2) It incorporated 5 fresh blueberries and 3) It didn’t arrive to the table all shiny from massive amounts of butter. 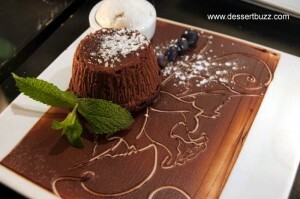 I also liked the way they used a nice dark Valhrona chocolate. It was served with really smooth vanilla bean ice cream (or was it gelato?). We also received a tray of 4 different Capogiro gelatos. If you don’t know about Capogiro, it’s considered by many to be the best in the US. What I love about them is their “anything goes” flavor choices, like Mascarpone and fig gelato anyone? These guys even have fan sites that covers their new flavors. The gelatos we tried are below, but really, you can’t go wrong. 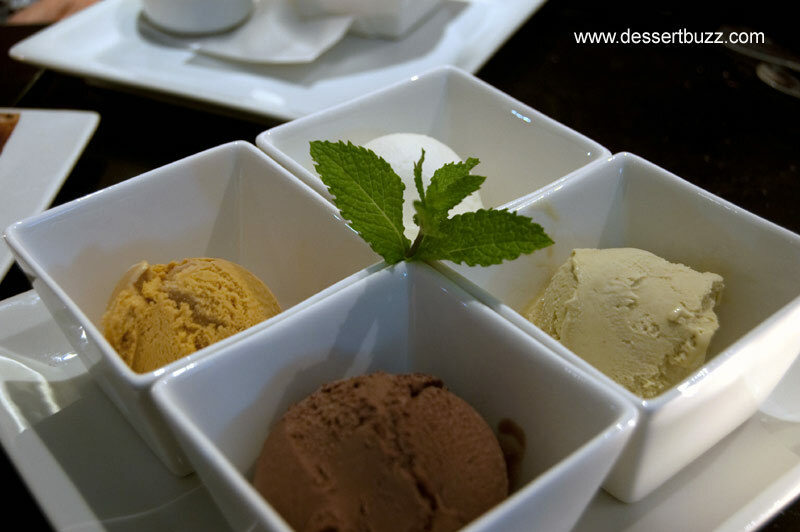 The flavors in our 4 bowls were: Goat’s milk rosemary honey, Mexican chocolate, Pistachio and Zucca (pumpkin). The crowd favorite at our table was the pistachio which had the smoothness that Capogiro gelato is known for. I liked the Mexican chocolate which had a lot of chile kick, but it was too much for my dining companions. The goat’s milk rosemary honey had a light, icy texture like a sorbet but the chef told us that it was in fact a gelato. One note on the savory side: Let’s face it, it’s hard to create a pasta dish in this city that really stands out. But sometimes there is that rare dish that makes you say to yourself “damn, I forgot how good house-made pasta is!” Well, that’s what I say to myself at least. Then I get really bummed when the last fork full is spooled up. In the last 2 years I have had 2 dishes that have supplanted my dessert daydreams and replaced them with thoughts about piles of fresh pasta. One was Michael White’s much-hyped fussilli with bone marrow and octopus from Marea that Serious Eats, Dessert Buzz and Frank Bruni (in that order mind you) raved about. The second was the Roasted Duck with egg fettuccine, brussels sprouts, pancetta, and pine nuts from 508. To me, this dish had it all, large pieces of super-flavorful roasted duck, browned brussels sprouts and absolutely delicious pasta. I can’t think of a better pasta dish in New York City that even comes close for $18. Celeste has some great house made pasta and sauce but those dishes are not nearly this complex. Recommended: Churros with Valhrona dark chocolate dipping sauce, the freakiest Capo Giro gelatos available the night you are there. Special savory Recommendation: Roasted duck with pine nuts, spinach, brussels sprouts, pancetta and olive oil tossed in spinach and egg fettuccini. 508 Restaurant and Bar is located at 508 Greenwich Street at Spring. Their web site is here. I found a book mark to this story from Christian Dillstrom – so you must be doing a good job as mobile & social media marketing guru provides a hyperlink to you.